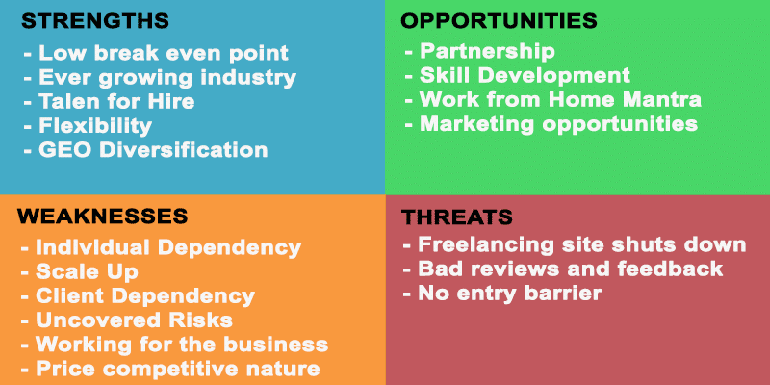 SWOT Analysis on freelancing as a choice of career for an individual and growing it to a complete business. You will read everywhere on the Internet about freelancing is very easy to get started and you can make a decent amount of money very easily but there is a flip side of it where many freelancer just have survival issues doing freelancing. SWOT analysis can help analyse internal and external factors that can make or break a freelancer. So let us do SWOT Analysis on freelancing as a choice of career for an individual and a business going forward. SWOT Analysis is an acronym of Strengths, Weaknesses, Opportunities, and Threats and helps us analyze the same (Strengths, Weaknesses, Opportunities, and Threats) of a project or person or business or partnerships. You can read about SWOT Analysis on Wikipedia in more detail. So let us look at the Strengths, Weaknesses, Opportunities, and Threats for solopreneurs or individual entrepreneurs and freelancers. Low break even point – Overhead for an individual based service business is always less and freelancing is no different. Less overhead means any individual can get started easily and reach a break even point in a short span of time. Ever growing industry – It is an ever growing industry and only on Upwork I see more than 1 Billion Dollar of Freelancing projects being posted annually. Thats a big industry with sizable growth. Talent for Hire – There are a lot of freelancers and small sized companies available at your disposal to get the job done for you. You don’t need to hire them full-time and pay as they deliver works really well. Flexibility – There is a lot of flexibility in what you want to be working on, how you want to work, where you want to work on and how much you want to work on. GEO Diversification – You can diversify your freelancing clients different geographical locations as well as many sources of grabbing new clients. 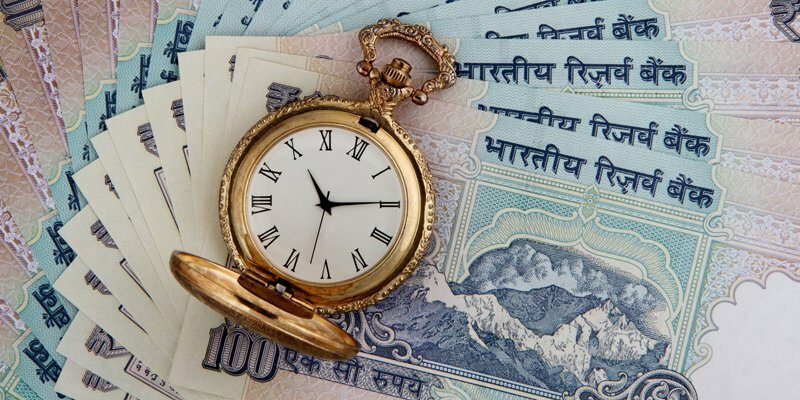 It not only provides stability but can help you take advantage of fluctuating forex markets. Partnership – There are lots of synergies that can be formed with other individual freelancer. If you are a web developer, you can partner with an Android developer or a web designer. Skill Development – Individual freelancers can develop new skills very easily and almost instantly. So many online courses on sites like Udemy and you can learn many new skills in less than a week time that a few years back could have taken ages. Work from Home Mantra – World is moving from a traditional work environment towards work from home and many fortune 500 companies are offering their employees to work from home. Marketing opportunities – May not only get clients from freelancing sites like Upwork but can easily setup other source of clients like a blog or get started with online marketing with Adwords or Facebook with just few clicks. Individual Dependency – There is a lot that depends on the individual freelancer. As it depends on an individual, it also becomes important what is skill and expertise the freelancer have. Expertise in high paying skills make things really easy for the freelancer. Scale Up – There is limited time in a day that an individual can work. So it becomes really tough for an individual to scale up the business. Need partnerships and synergies to really scale it up. Client Dependency – Solopreneurs and individual freelancers cannot work for more than a few clients at any given point in time and so if a large client moves on means a lot of impact on earnings for the freelancer. Uncovered Risks – No freelancer are ever prepared for something that can go wrong. On any day if my MACbook does not start, there is very little that I will lose because I keep all my data online and do a backup every few days. Working for the business – When an individual freelancer is working for the business to meet deadlines and complete the deliverables, he is very unlikely to work on the business and plan the roadmaps and strategies to move it forward. Price competitive nature – There are projects in some technologies like basic web design or data entry where the clients are more often looking to get the job done for as little as possible. There are sites like Fiverr where everything is being offered for as low as $5. Freelancing site shuts down – If your business depends only on sites like Elance to grab clients, you can just be making no income overnight like many business that relied heavily only on Elance for clients are finding it quite difficult to thrive in Upwork environment. Bad reviews and feedback – One bad rating on freelancing site can mean the loss of many more businesses opportunities moving forward. It could also mean no work from the site. No entry barrier – There is no entry barrier and you can start now and compete with the person that has decades of experience. As long as you know you can get the job and provide value, you are more likely to win a project over the person with a ton of experience.